When we last left our project we had just installed some Cosworth M2 cams and had tuned around that with excellent results. Some time ago we had installed an AEM water injection system and warning monitor system and had been running the water, mostly just for thermal control when running hard. 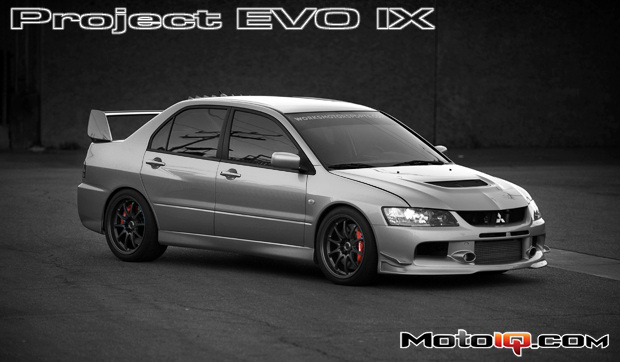 Read more about Project EVO IX Here! 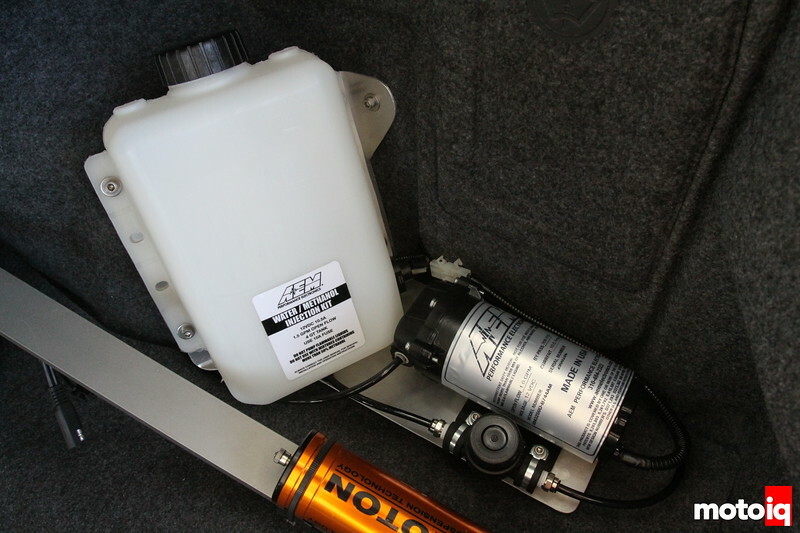 Here is our latest and greatest AEM water injection system mounted in our trunk. Read the back links to get all the details of how we got to this point. We knew to get best results we would have to tune our ECU to take advantage of the detonation suppression capabilities of water and to nullify the water's quenching properties which reduce power. At this time we also wanted to upgrade our ECU to take advantage of some of the latest developments in stock EVO ECU tuning that have transpired. To get our car ready we first wanted to have better boost control. 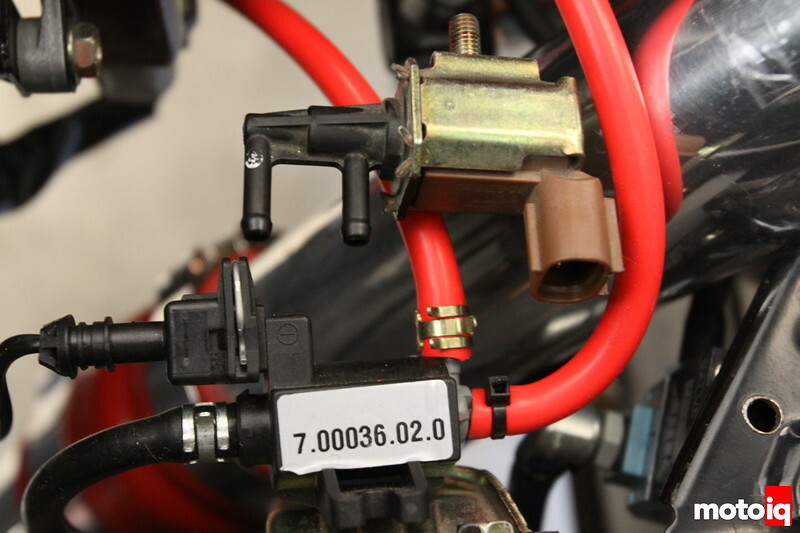 The stock boost control solenoid is a two port type that works by bleeding off boost pressure that is being sent to the stock wastegate actuator. This fools it to stay closed above the native actuator spring pressure until the solenoid's flow capacity is over run which then allows the wastegate to open. This simple system can be tuned via the ECU and works ok up to the low 20's in psi of boost pressure. The trouble is that the two port solenoid starts to get iffy above this boost level. Since we wanted to run in the high 20's for this next round of tuning we had to get something else. The stock gold color two port solenoid is shown up on top and the 3 port solenoid is the black unit on the bottom. We used Hose Techniques high temp silicone vacuum lines to plumb the solenoid. The Gruppe-S Engineering kit has a plug and play wire jumper harness so you don't have to hack up your stock wiring. We turned to Gruppe-S Engineering for their 3 port boost control solenoid kit for the EVO. 3 port boot control solenoids work better than the stock two port because the 3 port is set up to intercept the boost pressure going to the wastegate actuator by being cycled by the ECU, the 3 port actually controls the amount of pressure the wastegate actuator sees. This is more sensitive, faster acting and accurate enabling accurate boost control up to the limitations of the wastegate..